Targeted Flexibility Training with Lucas Rockwood: "Give Me Just 15 Minutes Per Day & I Can Double Your Flexibility in 4 Weeks!" This membership gives you access to our Gravity Yoga video course as well as great information and resources! With easy-to-follow videos and a day-by-day stretching schedule, this is an excellent tool for people looking to increase their flexibility. Gravity Yoga - At-Home Flexibility Video Course has been added successfully to your wishlist. Targeted Flexibility Training with Lucas Rockwood: "Give Me Just 15 Minutes Per Day & I Can Double Your Flexibility in 4 Weeks!" This membership gives you access to our Gravity Yoga video course as well as great information and resources! With easy-to-follow videos and a day-by-day stretching schedule, this is an excellent tool for people looking to increase their flexibility. Most flexibility gains are made outside of the yoga class, and this course is specifically designed to aid in your at-home stretching. Along with the videos, this membership includes great stretching guides and tips perfect for every yoga student, regardless of your level! Great Gravity Yoga Videos! Clear and informed instructions given in a calming yet engaging manner. Pace of activities is perfect – really like the delivery style and the stretches. You feel great after each 15 minute session. Perfect before bed or a gentle way to start the day. The Gravity Poses are powerful and challenging. I enjoy them as a great addition to a balanced routine. They are also a great way to identify where you’re holding tension. Gravity Yoga has helped me gain more flexibility but also improved my ability to truly get my muscles to fully release. Great product! Gravity Yoga got me started again and into my practice. 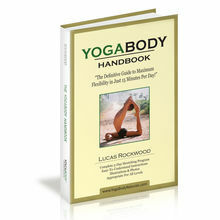 Normally, I am interested in yoga poses and related info but Lucas´ health and well being topics have been great! After practicing the Gravity Yoga series for four weeks, I see some improvement in my flexibility, posture, and mental calmness (I think from the focus on deep breathing) which carries into my everyday life. I plan to continue practicing Gravity Yoga daily until I reach my flexibility goals and then continue less frequently just for the health benefits of stretching. My main purpose for purchasing Gravity Yoga was to help with my posture and flexibility to make yoga poses easier for me. Tight hips, shoulders, and hamstrings hold me back from doing some poses as well as I would like to do them. Gravity Yoga includes some poses/stretches that I have seen before, but it also adds several new ones. The biggest benefit of the videos is that they help remind me to breathe deeply and stay focused in my stretches. The stretches are a real challenge, but my body feels good afterwards. I put the videos and mp3s on my iPad for easy access and use. After just 1 week I feel a difference! Great advice and responses. The Gravity poses are amazingly effective, after just one week I feel a difference! 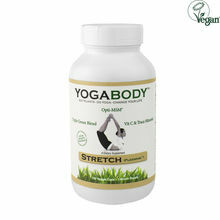 The YOGABODY Stretch supplements also seem to help me in kicking my coffee to the curb! Finally something I can stick to! I am naturally extremely inflexible, and I always have been. I practice yoga rather intermittently, so I have never really seen any gains in flexibility. When I found your gravity yoga program, I was excited to try something that was geared specifically toward flexibility. I have been using it for about a month now. It is slow going, but I have seen some progress, and am now able to hold the poses for the full time. It's the first program that I really feel I will be able to stick with long term and am excited to see the progress. The Gravity Yoga program has been really helpful for my flexibility and the podcast is a great! All round information highway for all sorts of topic, really enjoy both. I really LOVE the Gravity Yoga program. I really LOVE the Gravity Yoga program. The videos are short and very effective. I started naturally holding my yoga poses for longer time (100% home based practice) after listening to Lucas on the Yoga Body Talk show discuss how yoga classes do not build flexibility, they simply are a demonstration of existing flexibility. I completely agree as I practiced 4-5 years in a studio and once I started practicing at home and would hold poses longer, I increased my flexibility 10 folds! I've only been using the daily videos for a couple weeks, but I am already seeing improvements in my flexibility. So far so good. My ankles and back are stronger thanks to the Gravity Yoga Program. My hamstrings are more flexible. I LOVE your products! I started to use the Gravity Yoga Program to get more flexible. At the beginning I was able to touch a little bit under my knees I was so shocked, after all I´m only 35 years old and felt totally old. Today I can nearly touch my feet and feel great. Especially Hangman an Pretzel arms which really torture me while doing it give me a great feeling afterwards. The Gravity Yoga Program has helped me with flexibility and also gives me motivation to eat right! I was having sciatic and tail bone due to pregnancy and birth. The days I do gravity yoga, I have zero pain. The days I don't do yoga, my pain returns. I've just begun following the Gravity Yoga Program. Ive only done the program once so far (I JUST started) & have noticed a difference. Anxious to see what a month is going to do! Focusing exclusively on flexibility itself is challenging at times and very rewarding. It doesn't take long to notice improvements in all areas of fitness and range of motion that Gravity Yoga provides and it's only 15 minutes a day. Learning to relax and breath in Gravity Yoga has enabled me to experience deeper more relaxed poses when I practice yoga. It's exactly what I was after a quick easily accessible programme to target improving my flexibility. Working in an office I get very stiff especially in my hamstrings. I felt immediate benefit from the first session. Only thing I would say is the outward flamenco is very hard to achieve with less flexibility and didn't feel like it was creating a stretch with how far I could straighten my leg. The rag doll on the other hand felt amazing as did the first straight leg stretch and the last one that went across the other leg. The gravity yoga has been great…mostly for getting the mind ready for a good night's sleep with the added bonus of increased flexibility. I have only used the Gravity Yoga product for a few weeks but I am seeing the benefits. I like the format of targeting specific areas of my body on specific days. Quality of the instruction is very good and videos are well done! The podcasts keep my mind actively contemplating yoga. Gravity yoga taught me how to relax into a position not only while doing gravity yoga but stretches of any kind. My kids love doing inverted stuff on the swing. Gravity Yoga: At first I found all 5 to be too difficult for me and decided to do only shoulders. I reached much greater flexibility and can now hold the 5 min no problem. My arms feel longer and my shoulders freer. Hips, started 3 weeks ago where I could hardly fall forward. I now can definitely "hinge" at the hips when doing the third exercise. Even though I had no particular health benefit in mind apart from more flexibility I noticed how gravity yoga helps me to cycle and unicycle better as well as feeling more comfortable when sitting on a chair or on the floor. It's as if I am regaining more freedom of movement. Toe Spreader: I think my toes are more straight, my little toes less curled up and the bunion seems to have decreased in size. The Gravity Yoga Program has helped very much with my flexibility. I have never held stretches for as long as 5 minutes before. I've only been doing the gravity yoga video classes for three days but I'm already feeling significant improvement in my flexibility, love it! I also found the email messages re green juice, avoiding coffee extremely motivating. I know these things but the pulling everything together in your package is brilliant. Yep, I'm doing the juice and cutting back on the coffee, thank you. I have visited a lot of studios and classes by some yoga superstar types but nothing has been as effective for me as this course. Thank you! The difference in my flexibility is really the kicker here. Great product! Because you see results right away, that creates motivation to continue doing the poses daily. I was tight all over, hamstrings, hips, shoulders, backs, etc. Purchasing the Gravity downloads has improved my flexibility greatly. I, now, enjoy practicing Yoga. This has been a life changer for me. My flexibility has dramatically improved in the 6 weeks I have been doing the gravity yoga (still a lot more room for improving). It's so easy to do in my own time unlike trying to get to classes as I have tried to in the past. And it ends up saving you money! I have been struggling with some pain due to limited range of motion and just over all tight muscles. I have been doing Gravity Yoga for the past few weeks. I can already see/feel an improvement in my over all flexibility. It's been very helpful for my flexibility as well as a great relaxing time with my kids at night. Great advices excellent practice ! YogaBody products have been beneficial to me in numerous ways. I have been traveling for the last 12 months and never had room to carry blocks and other health products. Now with the gravity Yoga program and certain assets like the Block and Straps. I have been able to find more depth (form) in certain hamstring openers and balancing poses. I enjoy supporting a company that is taking initiative in spreading the message of Health and Yoga, while also taking a look at their business principals. Lucas is so knowledgeable about yoga and nutrition. I feel like I am constantly learning new information when I listen to the Yoga Body podcast. Gravity yoga has helped me gain more flexibility and strength. I love the program, and I plan on purchasing more in the future. The gravity yoga has helped immensely. I ride horses every day and this has helped a lot with opening my hips and lower back pain, plus general flexibility. I would like to see you do another video with more poses of this nature. I would also like it if you could explain how to come out of the pose since after 5 min in the pose it can be uncomfortable coming out. The breathing is amazing for sleep and General yoga practice. Looking forward to some flexibility in my legs and back. I do the gravity yoga everyday for approx 15 to 20 minutes and find it super. I and older woman quite stif as I have practised field hockey and golf and no streching sports in my Life. I am trying now to get some smoothness into my Life and find the gravity yoga very challeging and pleasant at the same time. It has help a lot. I am more flexible. The Gravity Yoga videos are an amazing tool to build up your flexibility and you can really feel slight improvements each time you practise. Everything is for my back. Since I have very little curve in my spine I have upper back stiffness with pressure on my t5 that is helped by pressure point massage using HSG balls, traction…achieved by hanging upside down, and gravity stretching moves that are easy and effective. I also love Lucas' podcasts, even though I resisted at first. Topics are very interesting and informative. Thanks Lucas! I love it. Some of the stretches feel very strong for me, which is what I was hoping for. They feel beautiful. Thank you YogaBody Naturals!